This was another quick easy day. We were on the road by 6:30am, had a quick mid-morning cafe con leche stop in Hontanas, an exquisite Medieval village and had covered 21 kms through the Meseta by just shortly after 11am. As these past couple of days have been getting hotter and hotter, that early morning walk is really appreciated. 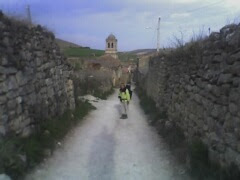 We had to stand aside and wait for a shepherd, his dog and donkey and a full herd of sheep to pass us as we came into Castrojeriz. The alberque here, Casa Nostra, is in an ancient house with rooms here, there and everywhere. Space to spread out our gear is always a bonus. It seems indulgent to walk only 4 1/2hours but Castrojeriz is another pretty little medieval town with a castille high on the hill above the town. John, Dayton and I decided to walk up to it before showers. It was a pretty steep climb but the views were well worth it. We climbed the steps up into the tower and had lunch looking out over the town and the wide stretch in every direction of the Meseta. We had heard how desolate and bleak the Meseta is and not a fun few days but we are all enjoying the quiet walks and the wide expanse of green fields although today we started to see the change to drier more limestoney fields.